A cairn with an arrow marks the route of Matthew Flinders on his way to the You Yangs. The cairn was originally unveiled in 1952. 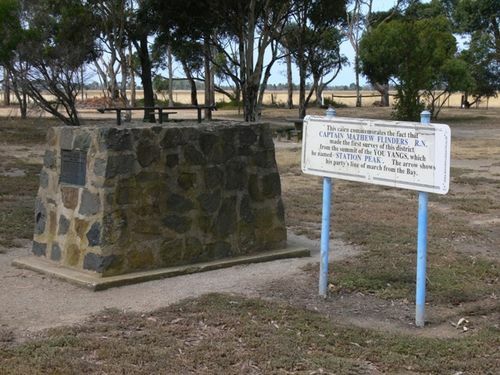 The tablet on the cairn marks the relocation of the cairn on the 22nd March in 1974 at the Bi-centenary of Flinders birth. A timber sign near the memorial indicates Flinders made the first survey of the district from Station Peak. This Line To & From The You Yangs. R. E. V. Donaldson Esq. Unveiled By Cr. B. E. Purnell J. P.
his party`s line of march from the Bay.